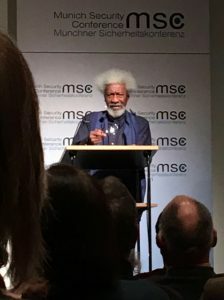 THE BUZZ in the lecture hall in the Literaturhaus München becomes more subdued as the minutes tick by – Nigerian writer Wole Soyinka, scheduled to speak as part of the Munich Security Conference, is late. The audience were told yesterday that he was flying in from Los Angeles. Is the flight delayed? Or – in this age, one can’t help leaping to drastic worst-case scenarios – had something more sinister happened? Literally an éminence grise with his eye-catching shock of white hair, Nobel laureate Soyinka explains what sets Cassandra and her heirs apart: “listening to the quiet, hearing the sounds of danger”. Soyinka has been speaking and writing with her voice for decades – he was imprisoned for using it in the 1960s when the government interrogated then imprisoned him for almost two years. He also criticised the 20th-century concept of “négritude”, current among intellectuals using it to oppose a mentality of colonial racism. Being deliberately outspoken about their ethnicity did not give Africans power but put them on the defensive. “A tiger does not proclaim his tigritude, he pounces,” he stated. Most recently in Africa, Soyinka says, “the voice of Cassandra was heeded” when former Gambian president Yahya Jammeh was finally forced to step down after repudiating the results of an election he did not win. Again he used that voice – the result of experience, of human knowledge, the practice of integrity – in the wake of the fall of the Berlin Wall. He relates how then French president Mitterrand convoked a conference of Nobel prize laureates. Asked for his opinion, Soyinka said that one of the few scientific principles he had retained from his schooling was that nature abhors a vacuum. The eastern bloc had crumbled. Had the rest of the world thought about what would take its place? “I think,” he told them, presciently, “it will be religious fundamentalism.” Only a few weeks later, the Ayatollah Khomeini in Iran issued the fatwa against writer Salmon Rushdie for the publication of his novel The Satanic Verses. It was, as he explained, the first act to show the militancy, the disregard for humanity and lack of conscience of a movement that has now ascended to be the issue of our era. “People say there was no warning,” Soyinka challenges, “but there is always a warning. The Cassandras in the world are never asleep.” He cites two examples in 20th-century literature in which her voice was loud and clear. Max Frisch’s The Fire-Raisers (also known as The Arsonists) describes how a normal, seemingly innocent lodger takes over the house of a bourgeois family until he and his cohorts have taken it over turned it catastrophically upside down. In Eugène Ionesco’s The Rhinoceros, we see the effect of “peer pressure, wanting to conform”, says Soyinka. “Do I want to stand out? Oh, my neighbour, his children are already grow their horn,” he quips. You wouldn’t want to cause a disruption or make them feel bad. These plays offer a stark depiction of how easily the moral framework of society is disrupted to a point at which it can’t be reversed without cataclysmic struggle. “What greater warning do we want from literature?” he asks. 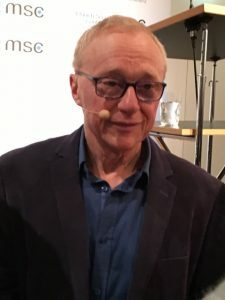 This inaugural inclusion of literature in series of talks at the 2017 Munich Security Conference was suggested by Dr Jürgen Wertheimer, professor of contemporary German and international literature at the University of Tübingen. A welcome and prescient addition – particularly under the aegis of Cassandra, who didn’t fare particularly well as the harbinger of bad but accurate predictions in a world gone mad. In introducing the writers of this series – Grossman at the start, with Wole Soyinka and Hertha Müller to follow – Wertheimer contributes to the discussion with his broad knowledge of literature, quoting Ingeborg Bachmann – “Writing with my burnt hand about the nature of fire” – as well as Turkish prime minister Erdoğan – “Some books are more dangerous than bombs”. Grossman, like Soyinka, Müller and other wise voices in the dark, is “doomed to be a writer,” says Wertheimer, “doomed to truth and reality, doomed to observe something other than the mainstream”. Sadly there doesn’t seem to be any mention whatsoever of this outstanding programme on the MSC website. Maybe the hosts and participants agree with Erdoğan. Which is perhaps not a bad thing. Perhaps they, too, realise literature has an explosive power to wield. There’s hope for us all yet. A design by artist Elke Härtel has been selected to commemorate the nine people who lost their lives at the hands of a lone gunman in front of Munich’s Olympiaeinkaufszentrum in July 2016. The memorial, featuring a living ginkgo tree, will stand opposite the site of the shooting in front of the OEZ shopping centre. 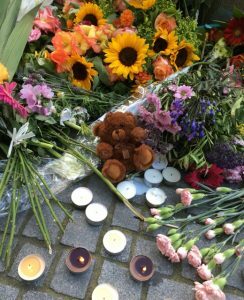 The attack, which took place after 6 pm on 22 July 2016, held the city of Munich in terrified thrall until the early hours of the morning, when the body of the 18-year-old perpetrator, Ali Sonboly, was found in a side street not far from the centre, where he had shot himself. 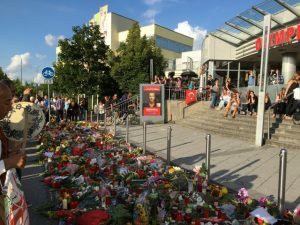 Munich was in lockdown for the duration while police tried to hunt down the perpetrators of what had all the appearance of a terrorist attack. Instead, Sonboly was discovered to have been a loner who planned his attack using a weapon obtained on the dark net. The tree will be planted in April in readiness for the official opening of the memorial on the one-year anniversary of the shooting. The design visualises the ginkgo encircled by a 2.5 metre-wide, stainless steel ring, partly sunk into the ground. Inside the ring, the names and images of the nine shooting victims will appear. The dual nature of the memorial combines symbols for solidarity, community and eternity (ring) with peace, friendship and hope (gingko).